2016 is the year. I swear. I’ve got a monumental birthday coming up this year and lots of writing goals to accomplish. I’m sure you do, too. Since I’ve never really used any apps to help me with my writing, I decided to do a little research and see if there were any worth checking out. Here are a few I came across, depending on what you need help with the most. This app works well for anyone who wants to keep track of their submissions, including fiction, non-fiction, magazine queries, etc. Features include the ability to store submission details such as dates, status, income earned, market guidelines, as well as notes on genre, word count for each story or submission. I have a hard time focusing, especially when left to my own devices (hello, Twitter and Facebook!) Pomodoro Timer can be used for any tasks, but also works well for writers. You set the timer for 25 minutes, get some focused writing done, and then take a short 3-5 minute break. For every four “Pomodori” you achieve, you get longer 15 to 30-minute chunks of time for breaks. Reviewers of the app say it serves as a great positive reinforment technique and helps them stay on track. Want to edit your manuscript in a portable fashion? With the GoodReader app, you can save your work-in-progress as a PDF, and then get busy highlighting and inserting sticky notes. You can then sync and import your edits into your permanent files once you are done. 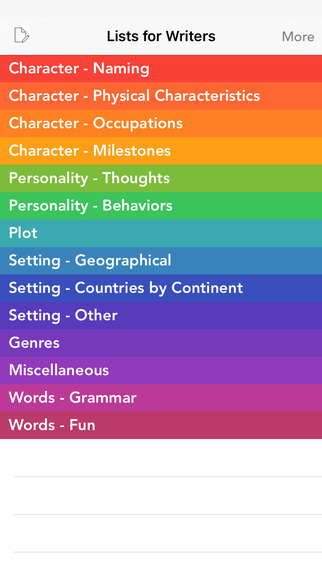 This app looks like a fun creative tool that can help you brainstorm character names, physical and emotional traits, plot lines, occupations, action verbs, and more. Use the notepad feature and e-mail or print out your notes later. It also includes dictionary support. Need help with plotting your story? A Novel Idea helps you create characters, scenes, locations and then link them together to form the plot. Arrange your individual scenes by dragging and dropping them into place. You can upgrade to a Pro Version for Dropbox syncing between devices word count and email exporting. 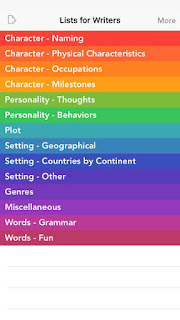 Have you used any of the above apps with your writing? If so, did you find them helpful? What (if any) apps help you stay creative and productive? 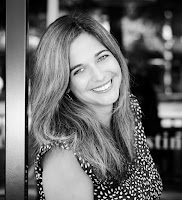 Renee Roberson is an award-winning freelance writer and editor. She has written hundreds of online and print articles and columns on a variety of topics, and loves to blog about all things related to books, movies, music and celebrity gossip and writing. She also helps authors publicize their books as a blog tour manager for WOW! Women on Writing. Renee--I'm vacillating between 30 and 40. I just saw a picture of your daughter, but I THINK you could have a kidlet that old and still be 30. So, I'm going to err on the younger side. Happy 30th birthday, whenever it is. And if you're going to celebrate the ___th anniversary of your 30th, have a great one. As far as keeping track of my submissions, I don't have dozens every month, so I just jot them down in a planner. (I'm old and old-school.) The time-management one sounds like I could put that to use, especially when I go on a writing retreat or devote a whole weekend to writing. I'll check that one out. The "Novel Idea" one sounds too complicated for my legal pad mentality but who knows? It might be user-friendly enough for even me. Thanks for the links, thanks for the posts, and may 2016 be a great year for you, your family and your friends. Sioux, I hope you know you made my day! I'm actually staring at my 30s in the rear view mirror at this point. My kids will be 10 and 13 on their next birthdays--I have no idea how that happened. I'm pretty old school, too, when it comes to technology and writing. One of my friends keeps trying to talk me into using that Scrivener software and I've resisted so far. I downloaded A Novel Idea awhile ago and haven't tried it yet. I hope to turn over a new leaf this year and send out so many agent queries I'll have to put Story Tracker to use. Wishing you an abundant year full of writing progress!